Background: Aquacleaner Environmental (AE) has refined and developed technology for dredging as a means of restoring and reclaiming lakes and ponds by manufacturing a small dredge pump and a unique system that delivers impressive results. Typical issues involved in the permitting process focus on the disturbance in the water and up land. Our system offers the means to remove accumulated organic sediment with a minor, short term impact in the water and because we don’t move large amounts of material at any given time, we can manage what we move up land with minimal impact as well. Our system is so unique that it was featured on the discovery channels show “Dirty Jobs”. Premise: Removing the organic silt build up that has accumulated over time and bringing the bottom back to its natural condition, will aid in the restoration and reclamation of a water body by reducing the nutrient load, removing layers of dead decomposing invasive plants and reclaiming the natural bottom. Science & Dynamics: Dredging is no longer a nasty eight letter word but rather the natural progression in the remediation of your water way because you are removing the biomass and nutrients that have accumulated over the years in an environmentally sound manner. 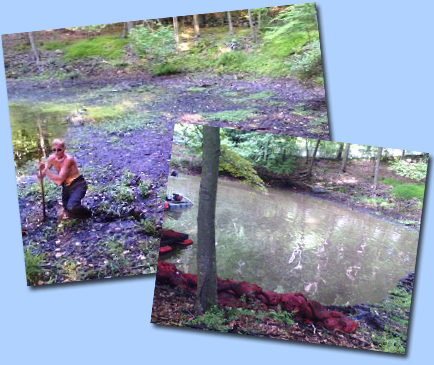 Firming up the bottom and removing the layers of fragments of invasive plants along with the organic silt has been shown to reduce the growth of invasive plants and prevent algae blooms. Our machines are designed to only extract the soft organic material and not change the natural hardpan contours of your bottom. How It Works: The traditional method for removing soil entailed having a large construction excavator operate either from your dock or out on a barge. This process is imprecise and not very effective. Scooping large volumes of soil from a water way is intrusive, disrupting the ecosystem and doesn’t afford a close tight cleaning. Pumps are the preferred method of dredging but the norm in the industry is large, aggressive machines, which move huge amounts of water (1500gpm and up) along with sediment and are very hard to manage in a smallcontained area like the backyard of your lakefront property. Aquacleaner Dirty Dredger: AE Aquacleaner has created a machine called the “Dirty-Dredger”, a multi-purpose utility dredge that addresses the types of material that is usually found along a shoreline perimeter of lakes and ponds. Aquatic plants, leaves, sticks, timber and assorted debris are always mixed with the sediment and will bog down any type of dredge pumping system because the consistency is such that pumps and intakes are continuously getting clogged. The nature of our system of dredging requires the machine be operated in the water and such allows us to manage the material we are dredging. The "Dirty Dredger" takes everything out of the water in one step, and then it segments the material, filtering out the solids and passing the slurry mixture directly into our 2- dredge pumps. As a result of this process we can achieve a slurry mixture as high as 60% solids and 40% water. This system is the perfect remedy for a variety of projects including suppression of Invasive Plants like Milfoil, Hydrilla, and Curly Pond Weed using our DASH (diver assisted suction harvesting). Suction Dredging operates by with a diver extracting silt and water together (slurry) and pumping it to a desired location. The most cost effective method involves pumping the material into a field and letting the water and sediment dissipate and be absorbed into the ground. Our second option is to pump the silt and water into a dewatering bag that sits on your property. Because we pump a low volume of water, and a high concentration of solids, we are able to contain, separate and manage the spoils and return water with ease. Return water filters out with good clarity but then passes through a permeation burm where it’s filtered to an even cleaner level and allowed to return to the source. The remaining water slowly leaches out and over a short period of time, the silt contained in the bag will harden and can then be removed. Set Up - All of our equipment is portable and is hand removed off our trailer and carried to the shoreline, where it is assembled. Again a minimum amount of disruption. Staging Area - An area will have to be set up that allows for the placement of the dewatering bag. We look for locations that are flat, clear and close to the watercourse so that water management is simplified. Finally a location that allows easy access for removal with minimal disruption. that surrounds the entire area and is supported and reinforced by rebar and rope. A later of “felt like” fabric is then placed inside the burm so that all return water out of the bag can then be filtered a second time before exiting back to the water source. Not moving large quantities of water at any one time allows us to manage the return water using a minimal amount of space up land. Aquacleaner Techniques - Our suction dredge process is the only method of dredging where a diver operates the suction nozzle by holding it off the bottom and creating natural slurry. This method is just an extension of suction harvesting and offers a minimal amount of bottom disruption and subsequent turbidity. This method also helps create a better concentration of water and sediment (slurry). When necessary we can pole dredge using a custom suction head with a water agitator that mixes the bottom material with water and allows an easy flow through our intake nozzle. Operational Logistics – A coordinated process including set up of equipment and staging area, dredge work and removal. Standard dredge machines move large amounts of sediment that are accompanied by large amounts of water, 1500gpm and higher, their slurry mixture is mostly water and less sediment. As a result the amount of space that is required to de-water this slurry is also significant. A logistical aspect that typically is hard to accommodate. Our Aquacleaner machines move only 300gpm, with a significantly higher percentage of solids, which allows us to manage our slurry in a smaller, confined area. Hydraulic cutter and auger heads cut into the bottom and create large amounts of turbidity in the process, which can be difficult to manage as opposed to our method of suction dredging. They cannot just remove small depths of sediment because by nature they are designed to permeate hard bottoms and create substantial depth. This hand’s on approach allows us to overcome the obstacles and challenges that lakes and ponds inevitably bring and has made UWS the leaders in water front restorations. Set Up and Break down - Since our equipment is small and relatively portable your costs your costs are minimal. Staging Area - Consists of hay bails, rebar, rope, burm liner and the dewatering bag. Removal - Our goal is to assist you in finding a suitable “final resting place” for your dredge spoils. In many cases this organic rich material can be used on your own property and when necessary a near by location can be found.